"It is fundamental to show children that one loves them and that one really wants to help them. The rest goes automatically. It is also a work of justice towards these children whose physical, intellectual and moral development is jeopardized by a life without affection, without guidance, without constraint, without obligation. The street cannot be educative in any way." Timkatec houses 50 orphans and educates about 500 of the poorest of the poor who must be fed and educated while the nation's ills continue. A thousand died and thousands more remain homeless after Hurricane Matthew. With tens of thousands injured by hurricaneS, the resurgent cholera epidemic added further misery. Food prices soared in 2017 after much of Haiti's food and clean water was destroyed. Hurricanes Irma and Maria in 2017 greatly magnified the crisis. The UN, Red Cross and the military provided immediate emergency help in destroyed Southwest Haiti as only they can. Weeks later, however, these volunteers and aid organizations left Haiti, and now the 2017 infrastructure is challenged again. Founder Father Simon has called for immediate funds for food and clean water. Our donations provide food and clean water for the children and youth of Timkatec. Please donate by clicking on the button. You can use the PayPal option if you are outside the USA. JULY 2, 2017, TIMKATEC'S 165 GRADUATES. As the Founders of Friends of Timkatec, we proudly announce 2017 graduation results. 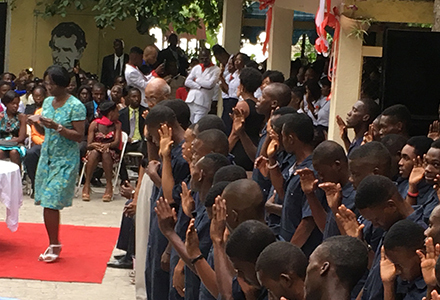 Since its founding in 2004, Friends of Timkatec and other donors have changed the lives of almost 3000 young people in Haiti, who previously had no hope of receiving education. The 79 boys and 86 girls who graduated from our two Trade Schools can now earn a living. The 13 from the Orphanage/Primary school have a life. Great achievements for Timkatec staff in this very difficult year. Sadly, due to the funding shortage, Timkatec had 150 empty places, causing the first annual decline in graduates since the school's founding. Please, tell your friends about Timkatec and its success against overwhelming odds. 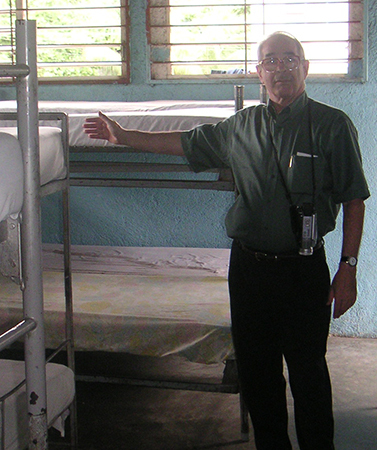 Father Simon has told The Friends of Timkatec that as a direct result of the massive reduction of funding since January 2015, Timkatec 2 and Timkatec 3 were forced to lay off staff and eliminate the mid-day meal (causing many day students who rely on Timkatec as sometimes their only source of regular sustenance to stop attending). To put it bluntly, loss of funding means that Timkatec has lost the resources necessary to serve an additional 150 students and shelter homeless children. Life in Haiti is so precarious that the promise of the future afford by an education can be lost simply by the loss of a guarantee of one meal a day. In 2007, we graduated the first class of just 15 students from Timkatec 2 and 10 students from the orphanage. To date, Timkatec 2 has graduated almost 800 apprentices with state-recognized diplomas as electricians, plumbers, masons and tailors. Trades that remain essential in the post-earthquake recovery of Haiti. 500 female students have now completed training as cooks and seamstresses at Timkatec 3, and 180 children finished Primary school at Timkatec 1. This year has seen 176 students graduate, compared with only 25 in 2008, a 604% increase. Thanks to Timkatec Schools, over one thousand young people are now supporting themselves, where no hope existed before. We know that each year, you are asked to support many worthy causes. Knowing what you have helped Father Simon to achieve at Timkatec, we ask you most humbly to put this at the top of your 2017/2018 donation list. It is your donations that cover the cost of each trade trainee and orphan in the current Budget. Yet, each two-year training course costs only $560 to change a life—a small cost by USA standards. These young people need our donations to fund their training. Please help them. In both 2016 and 2017, Father Simon, Founder of Timkatec, was invited to the Vatican as an individual who has made "street children" their pastoral mission. 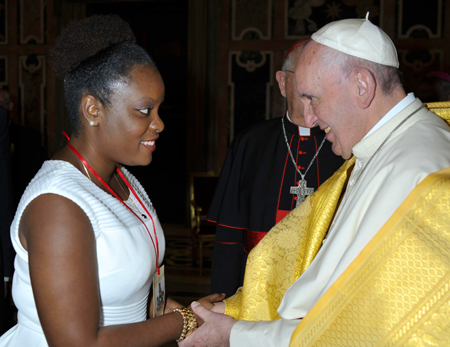 Pope Francis made a powerful expression of his concern for children and women forced to live on the streets, and personally met each attendee. 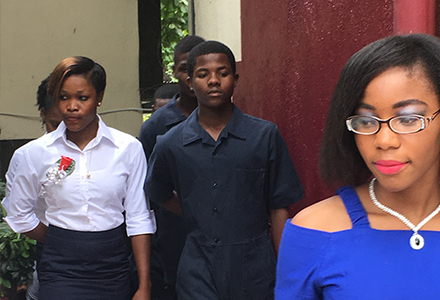 Father, now 87 years old, was unable to travel and Ms Aniath Vevenne Mathurin in 2017 and Ms Rachelle Fleurimond in 2016, Coordinators for the three Timkatec Schools, Orphanage, and Shelter, participated in his place. Pope Francis has shown his support for Timkatec and begs you to do so also. Read the full story, including video of the pope's address, here. The effects of this near-constant barrage of death and destruction on young minds are what we try to counter with the love and discipline of education—to rekindle their lost hopes. Many young people struggle with PTSD, haunted by memories of the death around them. No 2010 family in Haiti is intact. All lost family, friends and neighbors during and after, as 15% of the Port au Prince population died and 15% were wounded or sick, in just days and months, not years. 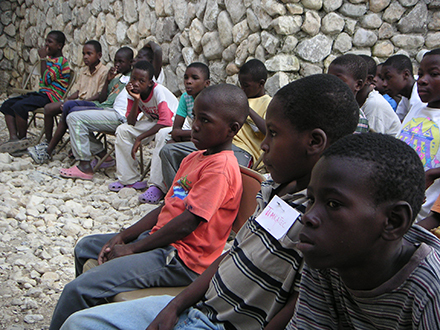 Timkatec Schools could feed and educate 680 young people in a time of desperate need for training in Haiti. But increasing lack of funding for teachers, food, tools and basic needs, means Timkatec currently only shelters, feeds, and educates 500 students. 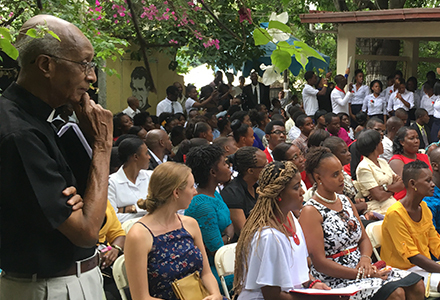 180 young Haitians could be off the streets, and receiving meals, basic medical care, and education in a trade which will change their lives forever. Now, those 180 boys and girls instead still suffer in extreme poverty, and in many cases are forced to leave their homes and live on the street—or worse. Timkatec relies on the tax deductible gifts from friends like you. A tax deductible gift of $280 will educate a student for one year, while $560 will fund a two year apprenticeship, to change a life forever. If we could raise just $50,000 more, we could add 180 places, and operate the schools at their full 680 student capacity. "Timkatec receives many admission requests; however they do not have room to accept them all. It is difficult to refuse a child who comes at night, in the rain, asking for a small place to sleep. In those instances, children sleep on the floor, sometimes with only a blanket, sometimes without even that. A rotation system was established, in order to allow children to sleep in beds on a schedule."